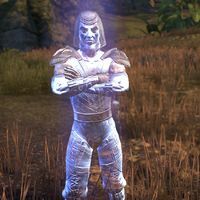 General Malgoth was a fierce Bosmer warrior leader of the Blackroot Clan. In his years, he destroyed multiple clans in his quest for glory. After his successful invasion of Dread Vullain, he and his men fell sick after they feasted on the poisoned bodies of those they slain. He later went to a nearby Nereid temple to request an antidote but was turned down. He died inside and his body is still located there to this day. Right of Theft: Uncover the secret of the '"`UNIQd2ba3934c6483345-cleanspace-0000034F-QINU`"'Blackroot Clan. "Something's changed. I do not understand what is going on here." "So it's true then? You have retrieved my bow from the Shade?" I have, and I invoke the Right of Theft. "My father told me, "You will find your bow in an animal's bone. Before it's even carved, you will see it." Mammoth's tusk―extraordinarily difficult to make a good bow out of―but it was just like he said. I saw it and I knew. I release you and your army from service. You may leave. "Heh. Death plays tricks. I thought you said "leave." But that's not possible. We don't deserve rest. Not after what happened here. The Ooze is the only fitting place for us." I want your army to march on Naemon in the name of the Dominion. "My army is loyal even deep within death, deep within the Ooze. They will do as I ask, and if I am asked to march on Naemon, then that is what we will do." (Unknown) "My army is loyal even deep within death, deep within the Ooze. They would march against the sun if I commanded it. They will march against Naemon." Good. Then I'll count on your support. This page was last modified on 10 August 2018, at 19:22.